When three women cyclists were left stranded in the desert near Al Qudra, they couldn't help but pray for a miracle to happen. And it did. Their saviour was none other than His Highness Sheikh Mohammed bin Rashid Al Maktoum, Vice-President and Prime Minister of the UAE and Ruler of Dubai, and his team, who happened to pass by. It is a heart-warming story of kindness for strangers, which reflects the noble soul that Sheikh Mohammed is. And the women can't stop showering praise on him for his extraordinary benevolence. It all started on a lazy Tuesday evening last November. 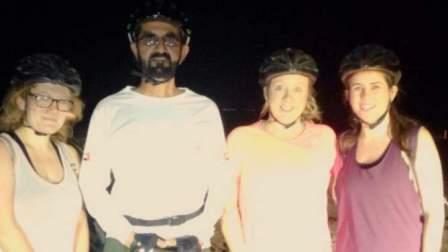 The three women planned to hire cycles and pedal for 50km towards Al Qudra. They carried a backpack containing a water bottle and an iPhone with 20 per cent battery. Their adventure was on track for the first 10km, until it went awry when the chain of one of the cyclists came off, according to a report in lovindubai.com. They were 10km into the desert. The sun had gone down and darkness had dawned. To add to this, the bike rental store didn't answer calls from the phone whose battery was about to run out. It was indeed a recipe for disaster. And the trio pinned hopes on a 'Godsent. Panic was creeping in, just when they saw a few men on bikes and the headlights of a car coming towards them. It was Sheikh Mohammed and his team. They waved them to stop. Initially, the rattled ladies couldn't believe that Sheikh Mohammed was amidst them and spearheading their rescue. When they realized it, they were delightfully amazed and couldn't thank him enough for his help. Sheikh Mohammed obliged them with a group photo. The bike was fixed and the women cycled for the next 40km with an incredible adrenaline rush. Sheikh Mohammed's kind gesture would live in their hearts and continue to inspire them to spread the warmth.